This week we'll start with the first practical case: tracking a trombone. 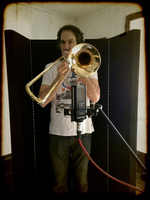 The trombone is a wind instrument from the brass family. To be able to record it under the best possible conditions you first need to understand its particularities. First of all, you must know that the sound is emitted exclusively from the horn, in other words the wide mouth at the end of the instrument. So this is where you'll need to focus all your efforts. 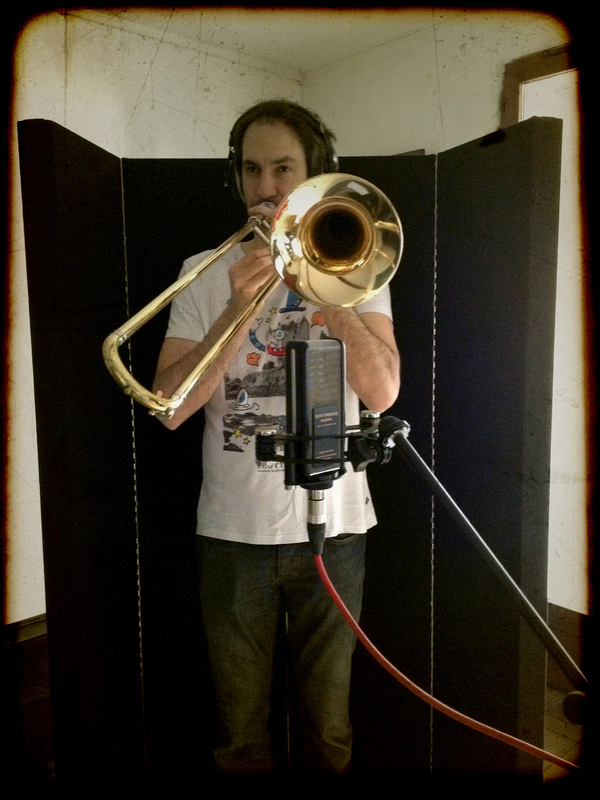 Next, you have to consider that a trombone can produce an extremely high sound pressure level. This means you'll have to be specially careful when recording it with your most sensitive/fragile mics in order to get a decent result and, especially, to not damage your gear. Last but not least, the attacks of the sound produced can be particularly "plosive," which you'll have to take into account when placing the miccrophones. You might even want to consider using a pop filter to avoid any nasty surprises. Let's move on now to the practical examples. 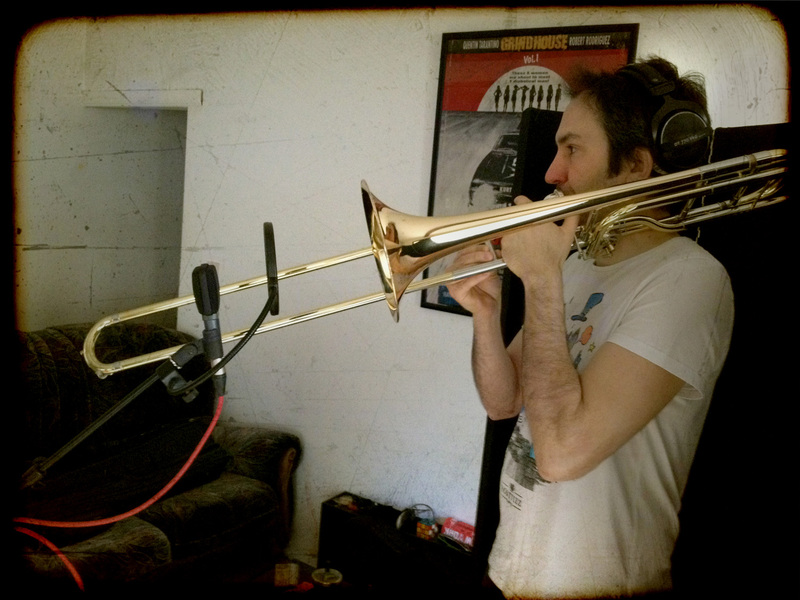 I'll put forward three different methods to record a relatively simple melodic line played by a trombone. In all three cases I'll use two acoustic panels placed behind the musician to try to isolate the mics as much as possible from the polluting sound reflecting from the back walls, which are the closest. It's interesting but might not fit every production. The brilliance of the AKG mic will certainly work fine on pop songs, but for other genres you might need to try something different. The result is more typical and, especially, much more "compressed." While less natural to the ear, this sound will work wonders on roots reggae productions, for instance. And it shouldn't come as a surprise if you stop to think about it for a moment, since brass instruments are usually miked like this onstage for this kind of music. Hence, even if the result is not very realistic it matches perfectly with a particular musical aesthetics deeply rooted in our collective unconscious. The sound obtained can be as smooth as you want it to be. This smoothness will be particularly interesting for jazz or classical music productions. And that's it for today. 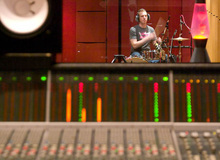 Do note, however, that the recordings presented here are out of context. My sole intention is for you to consider these methods as a point of departure for you to start experimenting in order to get the sound you want for your own songs. Because, even if I might sound like a broken record I must insist on the fact that the more you commit yourself to getting the right sound at the source the less work you'll have afterwards! I would like to thank Arnaud Arbalète for having agreed to dedicate a couple of hours of his precious time to record the audio clips for this article. And it's only natural that he is the first of many musicians to take part in this series since we've been friends for almost twenty years now. 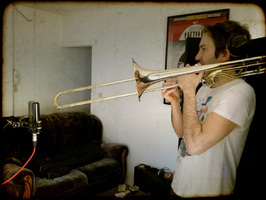 He is truly passionate about the trombone. 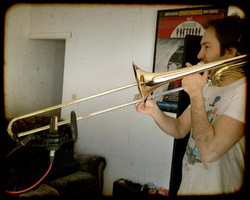 In fact, when he was four years old he told his parents that he would be a trombone player or nothing. This impulse led him to make his way into the No Named Family, which has allowed him to share the stage with the likes of Groundation, Jimmy Cliff, The Congoes, Alpha Blondy, Max Roméo, Barrington Levy, Sinsemilia, and Yannick Noah, among many others. His stubbornness has paid off, don't you think? Anyway, thank you Arnaud – for this and everything else!